DAILYKENN.com -- Hate groups killed 776 people of color in October, 2018. The number will likely increase as those wounded in the attacks succumb to their injuries. 706 people of color were injured in the attacks. The number is slightly higher than the 771 people of color killed the previous month. There were 152 violent hate crimes documented in October resulting in fatalities or serious injuries. 150 of the 152 hate attacks resulted in at least one fatality. 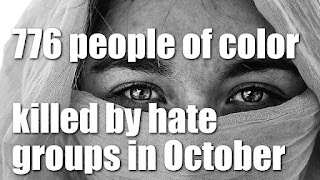 On average there were about five hate crime committed each day in October resulting in an average of about 25 fatalities per day or about five fatalities per hate crime attack. All were killed by Islamic hate groups. None were killed by neo-Nazis, the altright, the Ku Klux Klan, GOP, or white men. The count does not include eleven Jews killed at a Pittsburgh synagogue in October 27, 2018. American Jews are typically, though not always, identified as white rather than people of color. The deadliest hate attack was committed in Rashidiya, Iraq where 78 people were found dead. The body count included the remains of 54 women who were dumped in a mass grave. Fake feminists have not protested. Another 54 people of color were found beheaded and dumped in a mass grave in Taahki, Iraq. The Islamic hate group ISIS is accused of both atrocities. 36 black Christians were mowed down at a market in Kasuwan Magani, Nigeria and another 19 black Christians, including nine children, were killed by an Islamic hate group in Ariri, Nigeria. just think cair, the splc, Linda sansour, told me otherwise. someone is lying. we know islam is peaceful, they hate killing. ISIS is made up, islam loves you. just kidding, islam hates you. they will kill u given the chance.